Trying to find a WordPress theme for a music blog, recording studio, music portal, or fan club website? Set up a brand new website in the musical niche, suitable for any DJ, promoters, bands or fan groups using the variety of WordPress music themes available online. Here you’ll find great WordPress music themes made with bands and musicians in mind. Many of the themes include specific features required in music WordPress themes such as audio players, sections for discographies, album pages, merchandise shop and more. Most of theme people are searching it on our web blog so I just try to share cool free music WordPress themes for all of you. I hope you will be helpful from it. If you like our art collection, so check out these other posts will interest you too: Best Responsive WordPress Themes, Responsive Design Widgets for WordPress, Free WordPress Location Plugins and Inspirational Hexagon Web Designs. MusicPlus is an amazing free WordPress theme, great solution for blog about music. The theme comes with two sidebars, vertical menu, slider, custom widgets and lot of other powerful features provide a great base to build on. Music Beat is a up market free WordPress theme devoted to music or instrumental blogs. Its design is highly distinctive and packed with new commanding features. 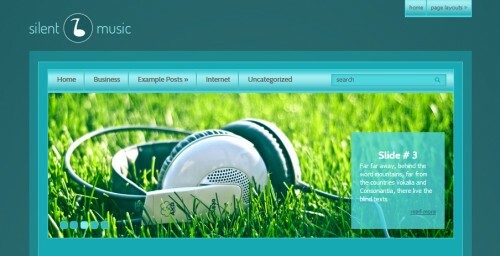 SoundBlog is an amazing free WordPress theme, great solution for blog about music. The theme comes with two sidebars, vertical menu, slider, custom widgets and lot of other powerful features provide a great base to build on. TheatreStyle is a 2 columns WordPress theme with Option/Admin Panel, slider, full width page and site map. Suitable for music WordPress sites. Green Colors is a new WordPress theme for personal related blogs and websites. This template has 2 columns and 3 other columns in footer, lot of place to put your widgets. 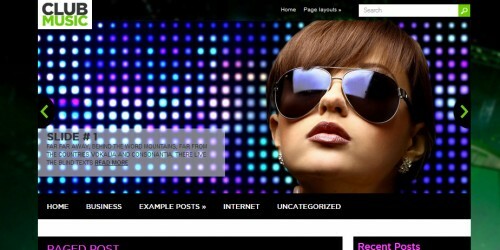 Beauty Effect is a new WordPress theme for music related blogs and websites. This template has 2 columns and 3 other columns in footer, lot of place to put your widgets. The background is all dark, that kind of color that makes you reveal your dark side. 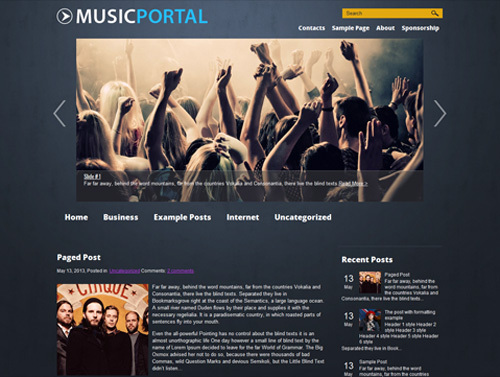 MusicPortal is an amazing free WordPress theme, great solution for blog about music. The theme comes with two sidebars, vertical menu, slider, custom widgets and lot of other powerful features provide a great base to build on. StormMusic is an amazing free WordPress theme, great solution for blog about music. The theme comes with two sidebars, vertical menu, slider, custom widgets and lot of other powerful features provide a great base to build on. MoviePlay is a WordPress theme for your cinema websites and blog. Every Friday new movies are being released at the cinema. But few are them make it to the box office.